Home / What Is Osseointegration? Implant specialist in NYC Dr. Navid Rahmani is an internationally recognized, Board Certified Periodontist and Dental Implant Specialist. All procedures are performed in our NYC Dental office in Midtown Manhattan. Our office equipped with cutting edge diagnostic equipment. During your dental implants treatment, you are likely to hear the word osseointegration. This word derives from ‘osteon,’ the Greek word for bone and the Latin word for ‘to make whole’ which is integrate. Osseointegration refers to the process that will take place between the living bone and the surface of your dental implant. Over a period of several months, new bone cells will begin to grow on the implant post and around it. This helps to hold the implant post securely in place so it becomes an integral part of the jawbone, ensuring it will be strong enough to support a new tooth. Dental implants are often specially treated to help encourage osseointegration as they may be coated with hydroxyapatite which is a substance that helps encourage new bone growth, or the implant post may be slightly roughened which creates a larger surface area, enabling more bone cells to grow on the implant post to ensure it will strongly integrate with the jawbone. Your new implant will generally need between two to four months for osseointegration to be completed. Once osseointegration has taken place, the implant can be ‘loaded’ with your new tooth. 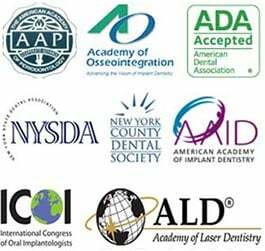 There are certain cases where your dental implant specialist in NYC or Dr. Rahmani may be able to immediately load dental implant. What Does It Mean to Load a Dental Implant? This is simply the process where a new dental implant tooth, which may be a crown, bridge or denture, is secured to the dental implant, restoring your ability to bite and chew. Traditionally loading an implant means waiting three to six months for the implant to osseointegrate with the surrounding bone, by which time it will be strong enough to withstand the substantial forces produced whenever you bite or chew food. In the meantime you will have a temporary prosthesis that does not place any force onto the dental implant. In many times occasions this is still the best option but there are certain cases where you may be able to immediately load dental implant. What Are the Requirements for Immediately Loading an Implant? Sometimes immediately loading dental implant may be a preferable option compared to waiting for osseointegration to take place. For dental implant to be immediately loaded it must be surrounded with a certain amount of strong and healthy bone and it has to be inserted in such a way that it will be able to withstand chewing and biting forces. With a single implant crown, it is possible to attach a temporary implant crown that will be specifically shaped to avoid contact with the opposing jaw during chewing. This will protect the dental implant until it has had time to heal and to osseointegrate. With full arch dental implants, in particular those meant to replace loose dentures, the implants are inserted at precise angles so that when they are loaded with a new arch of teeth, they will be locked in position and unable to move. Mini dental implants can also be used to stabilize loose denture. They are still made from the same high quality titanium alloy implants but their smaller size increases the versatility of treatment. A total lack of movement is essential if they are to fully integrate with the surrounding bone and this process will still need to occur regardless of whether a dental implant is immediately loaded or left to heal. When a dental implant is immediately loaded the restoration of a crown, bridge or denture is generally temporary and will be replaced by the final implant restoration once osseointegration is complete, several months later. The use of a temporary restoration is appealing to many people as they will still be able to smile and talk and can still eat while the implant gradually bonds with the bone.